If this continues to play out this way there is a good probability this wedge could drop the price back down to the support zone of the 4hr 50ma(in orange). Whether or not the 50ma will maintain support if it breaks own tot hat level is the question. 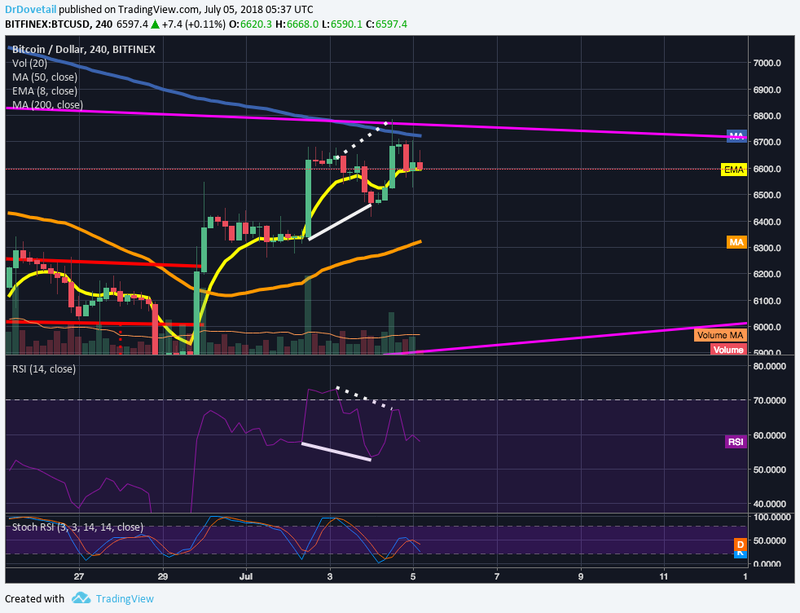 Of course we could always break upward too but I won't be confident of that until the 4hr rsi and stochrsi are low enough with the price action close enough to the 4hr 200ma(in blue) and the top trendline of the symmetrical triangle we are in (in pink) to be able to have enough momentum to surpass them both and trigger a breakout. As of now both those indicators could stand to be a little lower before the next upswing. If the upswing happens before they drop , it's very unlikely we will break out of the pink triangle.